Sharks and sea turtles are among the most poorly understood and enigmatic species on the planet. Working with sharks, such as this tiger shark (Galeocerdo cuvier), we integrate studies of form with data on movement, health, and diet, to determine the causes of complex shark movement patterns. We also work with partners to investigate the complex body shapes of sea turtles, and how they might affect swimming. In addition, we have begun a recent set of collaborations with Dr. Annabelle Brooks and Dr. Jeanette Wyneken to understand the complex 3D shapes of sea turtles, both among species, and within a species. Sea turtle species vary among different age groups in their overall body form, and they also vary among species, but the nature of these differences is poorly understood given the lack of museum specimens. Using the BeastcamTM technology we are using new techniques to understand these body shapes. In turn, we are working with Blair Perot, a faculty member in engineering at UMASS Amherst, to help us interpret how such morpholgoical changes could affect swimming. Hammerschlag, N, Luo J, Irschick DJ, Ault JS. 2012. A comparison of spatial and movement patterns between sympatric predators: Bull sharks (Carcharhinus leucas) and Atlantic Tarpon (Megalops atlanticus). PLOS ONE. 10.1371/journal.pone.0045958. Gallagher AJ, Wagner DN, Irschick DJ, Hammerschlag N. 2014. 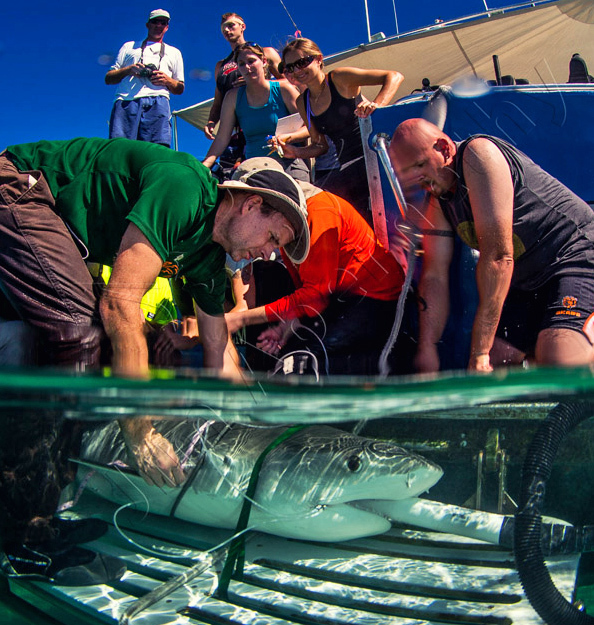 Body condition predicts energy stores in apex predatory sharks. Conservation Physiology. DOI: 10.1093/conphys/cou022. Irschick DJ, Hammerschlag N. 2014. A new metric for measuring condition in large apex sharks. Journal of Fish Biology. 85:917-926. Irschick DJ, Hammerschlag N. 2014. Scaling of morphology in four divergent shark species. Biological Journal of the Linnean Society. 114:126-135. Gallagher AJ, Hammerschlag N, Cooke SJ, Costa DP, Irschick DJ. 2015. Using evolutionary theory as a tool for predicting risk of extinction. Trends in Ecology and Evolution (Cover). 30:61-65. Fu A, Lauder G, Wilga C, Hammerschlag N, Irschick DJ. 2016. Ontogeny of head and caudal fin shape of an apex marine predator: the tiger shark (Galeocerdo cuvier). Journal of Morphology. DOI: 10.1002/jmor.20515 (Cover).